It seemed like yesterday that football season was just beginning. But time really does fly when you’re having fun. And having fun is what Catholic League fans enjoyed for the past 10 weeks. Now, it gets even better because the postseason has officially begun. Below is a brief synopsis of each Catholic League playoff game. Seeds one through four are in parentheses. Father Judge (4) vs. St. Joseph’s Prep (1) — 7 p.m. Friday, Nov. 7, at Plymouth-Whitemarsh High School. Earlier meeting: Prep defeated Judge, 35-14, behind four touchdown passes by QB Jack Clements. Summary: The Prep (5-3 overall) finished 3-0 in the division and the Crusaders (5-5) were the exact opposite. While the Hawks rely on seniors such as offensive linemen Jon Daniel Runyan and Mark Ehrlich, defensive linemen Joe DuMond and Jake Strain, linebacker Thomas Johnson, quarterback Clements (16 TD passes), division MVP John Reid (29 catches for 555 yards and nine touchdowns; outstanding in defensive secondary) and Olamide Zaccheaus (570 yards from scrimmage; 7 TDs), the Crusaders look to a wealth of underclassmen, particularly junior RB sensation Yeedee Thaenrat (1,205 rushing yards and 21 touchdowns), junior Prince Smith (33 catches for 694 yards, nine TDs, three interceptions), junior Tom Penko (team-leading four interceptions) and sophomore Raheem Blackshear (20 catches for 349 yards). If the Prep needs a big play, it might turn to sophomore D’Andre Swift (711 yards from scrimmage and seven touchdowns). For Judge, senior quarterback Zack Carroll (1,069 passing yards, nine TDs) is healthy after suffering a concussion; he did not play against the Prep during the regular season. Prediction: The Prep will throw much experience at the Crusaders and prevail, 38-7. Roman Catholic (3) vs. La Salle (2) — 7:30 p.m. Saturday, Nov. 8, at Plymouth-Whitemarsh High School. 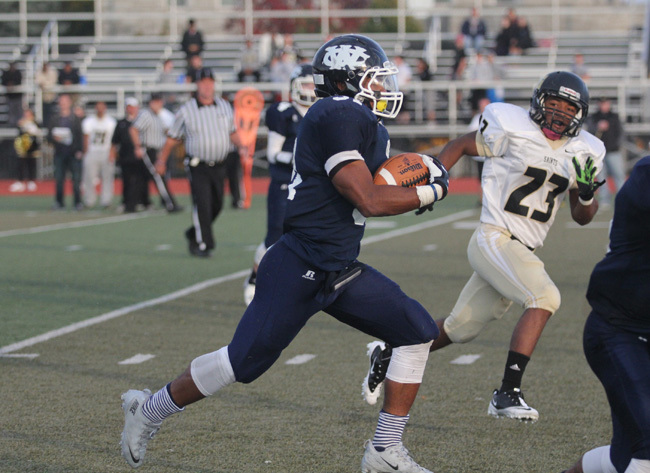 Earlier Meeting: La Salle prevailed, 38-8, as Jordan Meachum gained 125 yards and scored twice on 14 carries. Summary: The Explorers arguably have the best quarterback-receiver combination in the area. Senior QB Kyle Shurmer (2,238 passing yards and 26 touchdowns) and senior Jimmy Herron, the all-time Catholic League leader in TD receptions (61 receptions for 834 yards and 12 scores this year) create havoc for defensive coordinators. If that isn’t working, the Explorers will hand off to senior Jordan Meachum (121 carries for 655 yards, 8 rushing and 3 receiving touchdowns) or throw to senior tight end Charlie Hemcher (35 catches for 549 yards). For Roman, senior Dimetri Kelly has gained 890 yards and scored 10 touchdowns while senior receivers AJ Frazier and John Chaney have snared four TDs apiece. Senior Kenny Avalon leads in interceptions with four. Prediction: La Salle desperately wants another crack at the Prep, but to do that the Explorers must get past the Cahillites. That they will do by a score of 34-14. Cardinal O’Hara (4) vs. Archbishop Wood (1) – 7 p.m. Friday, Nov. 7, at William Tennent High School. Earlier meeting: Wood cruised to a 48-6 win, as QB Anthony Russo completed 10 of 12 passes which included two TD throws. Summary: The Vikings are 8-1 overall and in their three division wins outscored their foes by a scary 147 to 13. Senior Jarrett McClenton does most of the damage on offense. He has gained 1,158 yards on 109 carries and scored 19 touchdowns (two of them receiving). Aforementioned junior QB Russo has tossed 20 touchdown passes, two of them against O’Hara. In the All-Catholic voting, the Vikings dominated. For O’Hara, RB Max Ferguson has rushed for 1,060 yards and five TDs and receiver Darell Jackson has caught 44 for 590 yards. The Lions will try to maintain focus despite playing without their interim head coach and division Coach of the Year Paul Strus (he replaced the late Danny Algeo, who passed away in July). Strus has been placed on administrative leave; offensive coordinator John Ward will take over for now. Prediction: Competition wise, Wood should be in the AAAA. The Vikings are much too strong against an overmatched O’Hara squad that enters the game 1-8 overall. Wood will win, 48-0. Archbishop Ryan (3) vs. Bonner-Prendergast (2) – 5 p.m. Saturday, Nov. 8, at Upper Darby High School. Earlier meeting: In a classic finish, QB Collin DiGalbo threw a seven-yard touchdown pass to Tyler Higgins and the pair connected for a two-point conversion toss with no time remaining on the clock to give Bonner-Prendie a thrilling 21-20 victory. Summary: The Raiders (4-5 overall) rely on their vaunted running game in the form of division MVP Samir Bullock. Aided by incredible performances against Archbishop Carroll (373 yards) and Cardinal O’Hara (301), Bullock led the league in rushing with 1,553 yards on 216 carries. Of his 18 TDs, 15 occurred via rushing. The Friars (8-1) possess a superb quarterback in DiGalbo. Whether passing (94 for 164, 1,327 yards and 12 TDs) or running (144 carries for 653 yards and 11 touchdowns), DiGalbo usually makes something happen. His main targets are Higgins (26 for 338 and 4 TDs) and Joe Oquendo (28-352, 4 TDs). Prediction: This is probably the game of the week. It has overtime written all over it, but such an outcome is unusual. The Raiders didn’t make the playoffs last year despite going 8-3 and beating two state champs (the Prep and Wood) during the regular season. Many of those players remain annoyed at that. Buoyed by long-lasting motivation, the Raiders will edge the Friars, 28-27. Neumann-Goretti (2) vs. West Catholic (1) – 4 p.m. Saturday, Nov. 8, at Cardinal O’Hara High School. Earlier meeting: West Catholic defeated the Saints, 30-13, as Kharee Ruley amassed 135 yards and a touchdown on 19 carries. Summary: West Catholic (7-3), which defeated Conwell-Egan in the semifinals, blitzed through the division. Despite losing QB Antwain McCollum midway through the season (he had already established a school record for passing yards), the Burrs continued to excel behind Ruley (832 yards and nine rushing TDs) and sophomore RB Calil Wortham (10 TDs). For Neumann-Goretti, which bested Lansdale Catholic in the semis, quarterback Ray Lenhart completed 80 passes for 1,254 yards and 11 TDs; sophomore RB Aamir Brown scored five TDs rushing and five more receiving. He also picked off four passes. Prediction: West Catholic scores early and often en route to a 34-14 win.